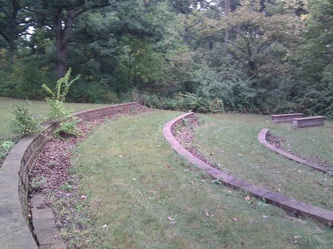 Oak Prairie Junior High School has an outdoor classroom on their property in Homer Glen, Illinois. 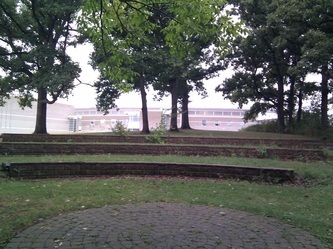 Students in 6th through 8th grade are housed in the school building and are able to access the outdoor classroom. Above are pictures and below are descriptions of this outdoor classroom. Image 11 is the view from near the school building, where you are able to see the corner of the school, then somewhat of a path in the background, leading to the patch of trees in the far background. Images 12 and 13 show a view of the classroom from the upper sides, while Image 14 shows the perspective of a possible student sitting on the stones during a class lecture or discussion. Image 15 shows the view of where a teacher may stand – in the foreground – looking at the students sitting down. 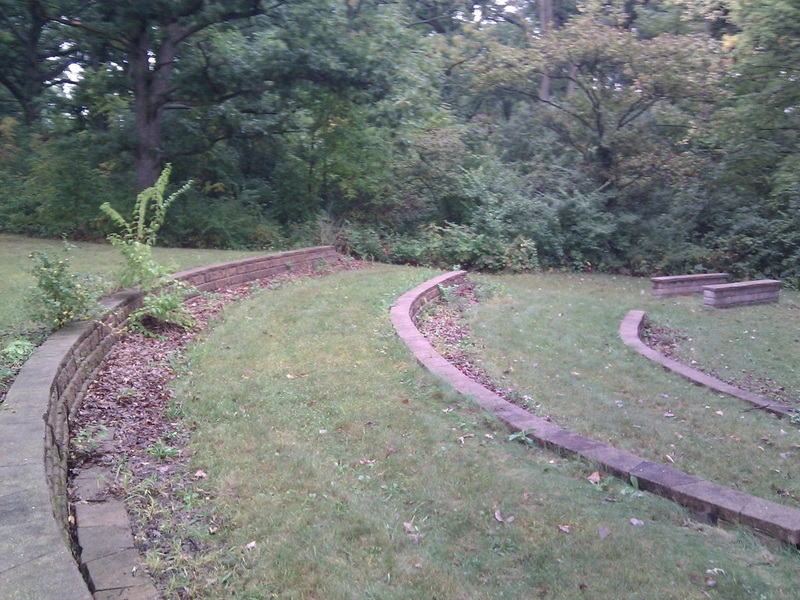 This outdoor classroom was a good size to fit about 30 students very comfortably on three levels of sitting stones. 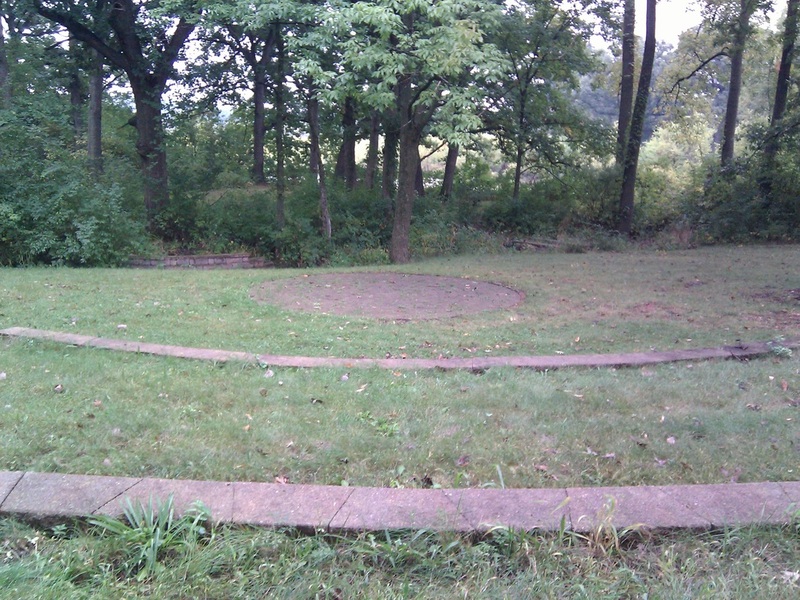 Again, the shape was a semi-circle, with the focal point being the center of the circle. At the center were some stepping stones where an instructor can teach the class. I was happy to see that an outdoor classroom was at an actual school building, as opposed to the other classrooms found – at a forest preserve and park district property. 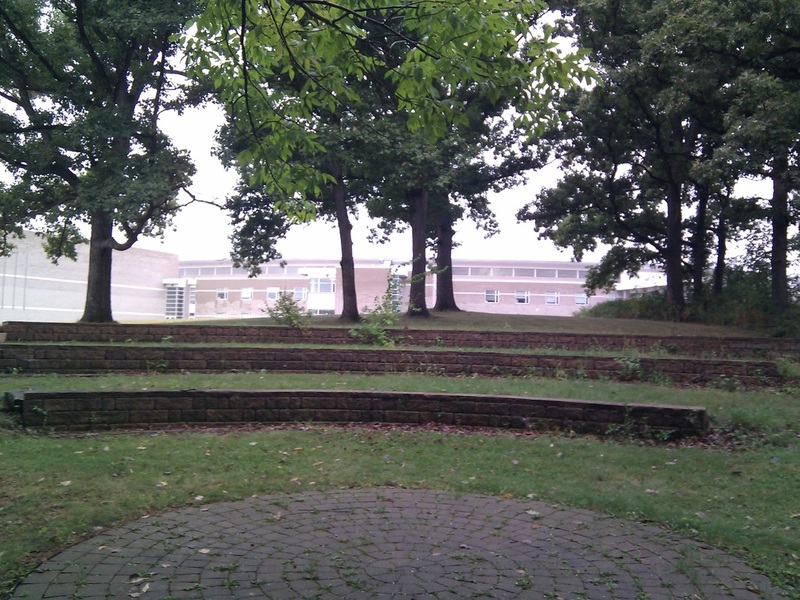 I was also happy to see that the outdoor classroom was located a good distance away from the school, and was not blatantly obvious when looking from the school. This provides a sense of security and yet a sense of being away from the daily routines of school. There were trees surrounding the outdoor classroom, providing for shade from the sun. 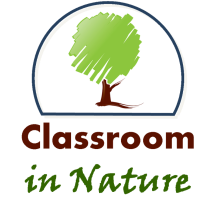 The outdoor classroom was surrounded by woods, grasses, a dry creek bed, among other things, which made this feel truly a part of nature. 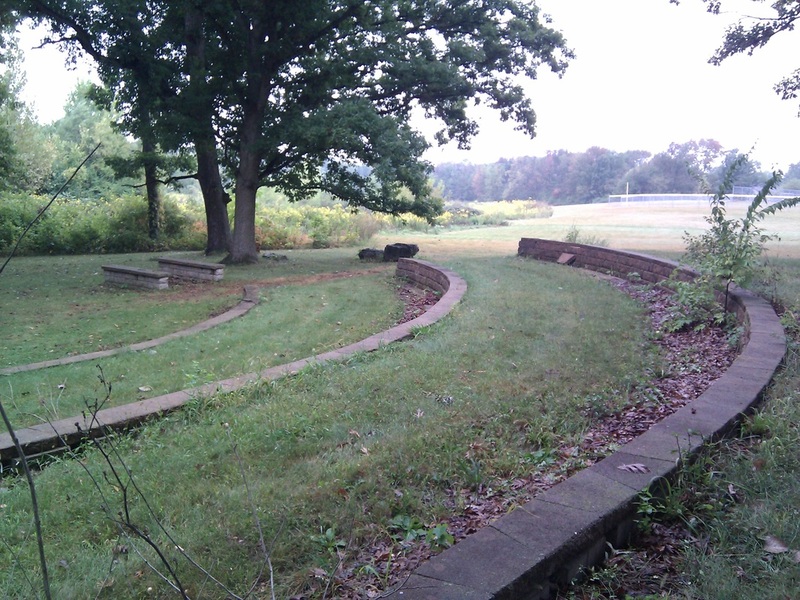 After the short walk to the actual outdoor classroom, I was unpleasantly surprised to see that the space was in disrepair. As seen in Images 12 and 13, there were large weed and tree species growing in the middle of the outdoor classroom from one of the sitting stones. 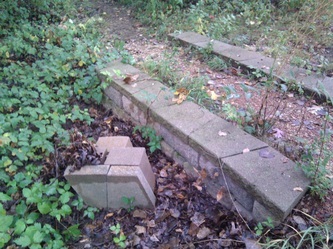 Although the grass was cut throughout the classroom, there were many dead decaying leaves along with sticks and twigs all over the ground of the outdoor classroom. 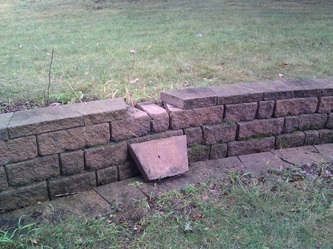 Unfortunately, it looked as if this space has not been properly maintained for the last few years. 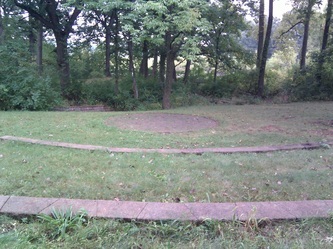 A dedication stone at the classroom marked the opening of this outdoor classroom in 2005, and I would estimate with the growth of the tree in the middle of the sitting stones, that the space has not be weeded in the last two to three years. Even if the weeds, leaves, and sticks were removed from the space, I do not feel this outdoor classroom would be safe for students. In Image 16 below, you will find a picture of a sitting stone removed from its original spot and put unto the ground, which makes me concerned that other sitting stones can fall as well. Also, in a trail leading out of the classroom, there is a little stone bridge over a dry creek bed. 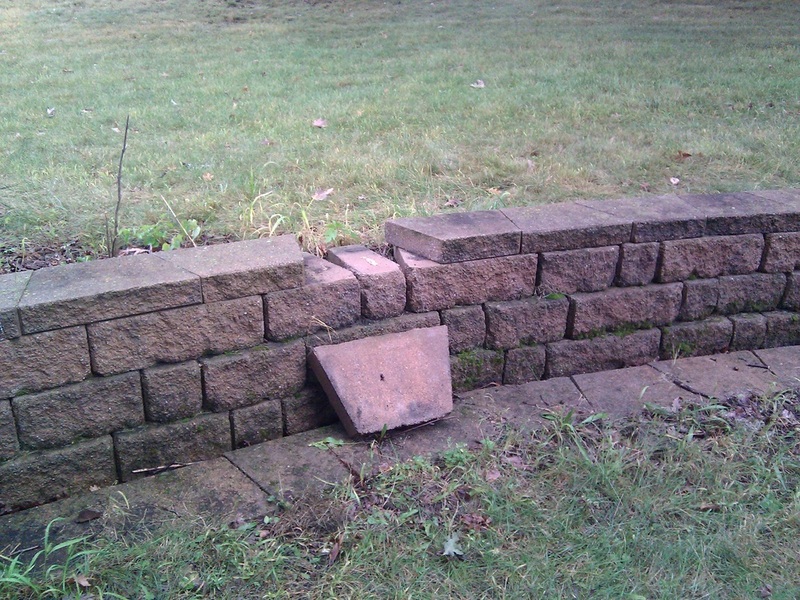 A large chunk of bricks was broken off the wall of the bridge and laying on the ground, as evident in Image 17. I was pleasantly surprised, although, to find that there was a long trail leading from the outdoor classroom, as well as a pond sitting near the outdoor classroom. 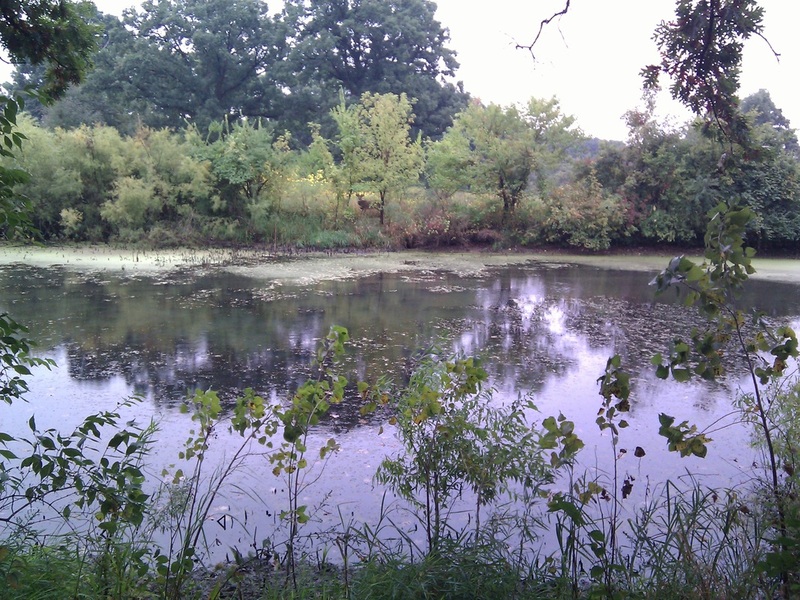 This pond and trail would allow for much outdoor exploration and discovery. Not only that, but it would provide for an amazing getaway from the hustle and bustle of the daily routine of the school day for students, faculty, and staff. 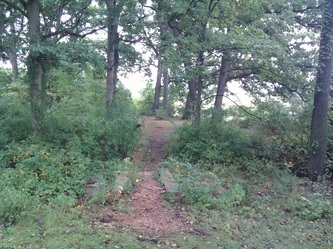 Below are images of the pond and trail. Image 18 is a view of the pond, just 75 feet from the outdoor classroom. This space would provide many opportunities for classroom discovery and experiments. Image 19 is a view of the entrance of the trail. 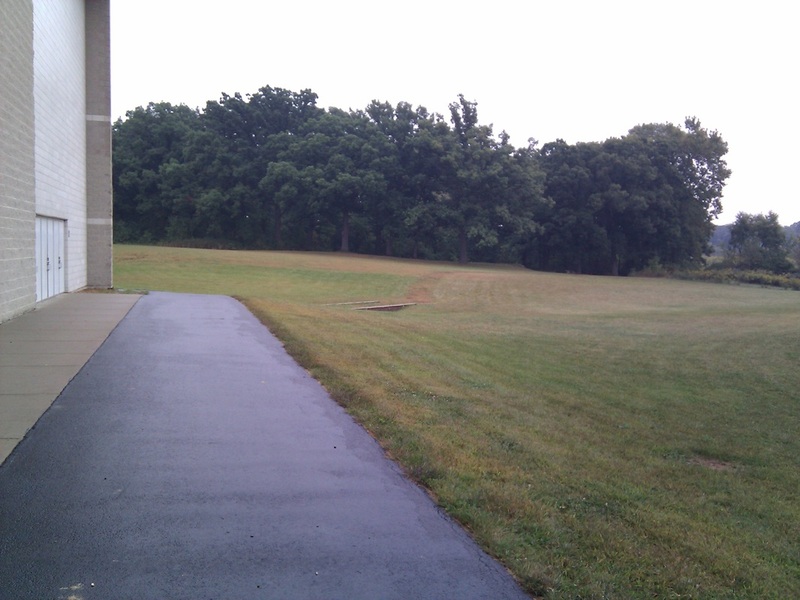 Image 20 is just one spot I stopped to take a picture of the trail, and Image 21 is a spot on the trail that opened up into a large area of cut grass – perfect for a class to meet with a teacher to talk about specific topics being taught for the day. I was surprised and impressed to see that this entire trail had cut grass throughout. Not only this, but it was a very long trail, that also had branches from the main trail. I did not walk the entire trail, but did walk a total of about one mile. I was amazed to see the different types of environments the trail took me to. 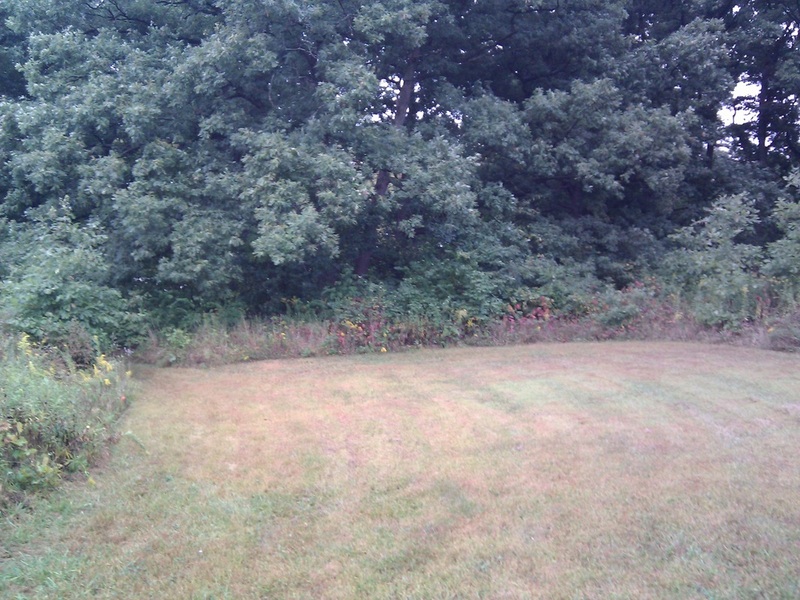 First, I started in the woods by the outdoor classroom; the trail then led me next to the pond and through more woods. 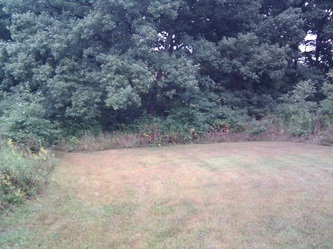 Suddenly, I was out of the woods and into a clearing of cut grass. 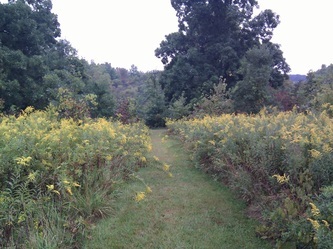 I was then surrounded by grasses and wildflowers almost reaching five feet tall. There were many different types of grasses and flowers, and before I know it, I was back into a patch of trees on the trail. Once on the trail, I had a forest on my left side and wildflowers and grasses on my right side. This trail provides much opportunity for all students to participate in experimentation and discovery outside the classroom.